UPDATE: The entry form is closed! I’ve posted our stunning results at “66 Faces of Photography“. DISCLAIMER: Don’t really shoot yourself — it’s dangerous. Instead, you should photograph yourself. Martin and I take no responsibility if you take the project title the wrong way. It’s that time again… yes indeed, time for another fun project! This is a joint project with the very talented Martin Gommel, and it’s open to anybody with a photography blog, a photoblog, or a photo-sharing account like Flickr or Zooomr. Before we get into the goals for the project, here are the requirements. 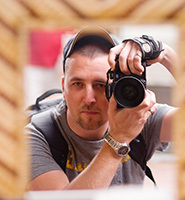 Take a self portrait and include your camera in the frame. Post your photo on your photography blog or photoblog. Go to the form at the bottom of this page and send me your name, email (kept private), and link to your project entry. Now, I realize that not everybody has a photography blog that they can post to, so this project will also be open to those with Flickr or Zooomr accounts (or any others that you might use). Just send me the link to the page with your photo! LIMIT ONE ENTRY PER PERSON, NOT PER SITE! Your blog should be primarily oriented toward photography, otherwise use a photo-sharing site for your entry. I’ll be displaying the first 8 entries at the bottom of this page as they come in, so other participants can get a few ideas for their own photo. So be quick about it and ensure that you get some extra exposure. WHAT’S THE POINT OF THIS PROJECT? Some months ago, Martin Gommel (the guy in the photo at the top of the page) came to me with a concept of starting a project that could connect photography bloggers and photographers on a more global scale. 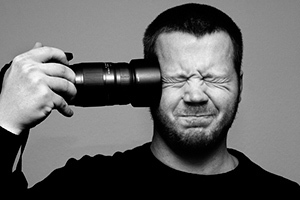 So after a few emails, we landed on the idea of self-portraits that included our cameras. Photos aren’t bound by the walls of language or nationality. We can all see, interpret, and understand each other’s images even if we don’t speak the same language. We don’t know what kind of reach this project may have, but we wanted to make sure that anybody from any place could participate — and everybody could enjoy viewing the results. The reason we’ve chosen to go with the “self-portrait” aspect is because we often remain hidden behind our blogs, galleries, or Flickr accounts. People associate us with a photo, a logo, or a writing style rather than a face. This is a chance to show yourself to your onlookers, and to show them that you’re very much human just like everybody else. We want you to include your camera in the photo to show that we’re all photographers and we all use different tools to create our images. It’s also a chance for you to get creative with your camera and do something you normally wouldn’t do. We’re limiting the blog portion of the project to photography blogs and photoblogs because we would also like to put together a nice resource list of photography sites out there, displayed in a neat little mosaic of self portraits. I ran a similar thing a while ago (but I only asked for links rather than self portraits), and I had a whole ton of readers (59) pipe-up about their websites. So hopefully we’ll get a lot of participation this time around too. This is the main project page, including the official rules and entry form. If you translate this page to a different language, send participants here to fill out the entry form and let them know what needs to go in each field if it’s not obvious. Martin and I will check out the entries as they come in to verify that the project requirements are being fulfilled — if they’re not, we’ll get in touch with you. I’ll be grabbing a copy of your image, square-cropping it, and downsizing it to 120 pixels as shown below. The picture will link to your project entry so people can see the larger image. DO post something larger than 120 pixels on your site — the point of the project is to see who you are. Like I said, the first 8 entries will be posted on this page permanently, in addition to the final project page. Blog entries will appear in the first group of images on the results page, and entries hosted on photo-sharing sites will be in a second group of images. The final list will be published on January 9th, 2008. I’ll then email all of the participants the 120 pixel images and the html code in case you want to republish the results for your readers. Just fill it out, hit the button, and wait for my reply. One entry per person! So pick your best site if you have more than one. In the “Link” box, give me the link to your page with the photo — not the home page. You’re too late, it’s over! This entry was posted in Features, Projects on December 13, 2007 by Brian Auer. That sounds like an awesome project. I will be participating! Sorry to double post but now that you’ve posted the first few photos, I noticed something curious. Anyone else see that almost all of us are holding the camera on the same side? Ahh but which side IS it? How many of us shot into a mirror, like myself? If the camera appears on the right in the shot, and we were shoting into a mirror, then we were holding it in our right hand. But did everyone use a mirror? Martin doesn’t seem to be using a mirror, and his camera is on the left, so perhaps he is also holding his camera in his right. Does that mean we’re all right handed? Or simply that cameras are designed only to be held in the right hand? Excuse my audible musings I just thought it a curious observation! I’m thinking most of the mirror shots will be coming out with the camera on the right — the buttons are usually setup to shoot right handed. Come to think of it, I don’t know that I’ve ever seen a slr or compact camera with the shutter release on the left — I’m sure something exists though. Now left-eye vs right-eye is an interesting conversation too. I noticed a while back that my dad shoots with his left eye while I shoot with my right. It looks like Marco is a lefty too. There sure are a lot of Canons up there (besides Trevor). I guess it’s time for us Nikon users to step up, eh? I’ll work on something over the next few days (although I don’t typically do many self-portraits, mind you). You might just get me out of my shell, Brian. No doubt, Canon dominates the marketplace. Last poll I did for camera brands showed that 50% of my readers shoot with Canon while only 25% shoot with Nikon. Self portraits are tough, but they can be kind of fun once you get into it. I’m going to try getting a better one of myself — Martin had to go and take that amazing shot, thus making me feel inadequate. You also didn’t have a Canon in your hands! what?, you mean there are people out there who actually have more than one camera?! @Juan. I have 10 at last count 9 film and one digital. For the sake of attempting to gain entry into the first eight, I had to use digital. @Brian. I almost ha d Canon in my hands – I own an AE-1 – though I’m guessing you were talking about digital…I thought the Rolleiflex had more impact. I liked Hitesh’s idea, and also your “self portrait with monitor” shot a while back, but my computer doesn’t have enough RAM to cope with anything but minimal post processing, so I had to get tricky to begin with! Did you know it beforehand? Wow, that photo is WAY cooler than mine — there’s a whole story wrapped into one photo. I hadn’t seen that before. Submitted a while ago…should I be expecting a email confirmation? I used the glass door to my entertainment center as opposed to a mirror. I have never done self-portraits, a good challenge for me. How many submissions have you had brian? I got your entry on the 20th, and I’m showing that I responded on the 20th. You didn’t get the email? I’ll send it again. So far, we’ve had a total of 40 entries (plus Martin and Myself to make 42). There seem to be a few more Flickr entries than photography blog entries. I’m not sure if SherwinD submitted his entryhere, but he left a comment on my site with his entry to the project. I’ve sent him an email to get him over here. With a almost two weeks before the deadline, 40 entries is pretty damn good. Congratulations! I can’t wait for the final list. I would have thought so too, but anything that requires a little bit of work will naturally reduce the number of participants. I think the photographyVoter post is helping a bit — I’ve had a few more come in. I want to say thank you again for this project. It really pushed me to do something I am not comfortable with and that is taking pictures of myself. I really thought the whole time I was going to do some kind of reflection shot, because I don’t mind those so much, but that isn’t what happened in the end. One of the fun things about photography is when you surprise yourself. I’m really looking forward to seeing everybody’s entries. I made under the wire. Hope you like the photo! I found this contest through Drew (above commentor) and I just had to enter, what a neat idea. I had done a “meet the photographer” post earlier today, I wish I had known about this contest before hand, but I know now, so that’s cool. Well heck, I’m probably the only one to use a Konica Minolta. Most really new photographers are like Konica who? You got me there Brian, I had to google Konica! I have sent my photo for a project – but i didn’t received any confirmation – can you check if everything is OK ?? I sent a confirmation — check again, and check your spam too.